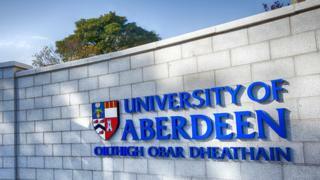 An anti-abortion group has launched legal action against the University of Aberdeen and its student association for alleged "unlawful discrimination". Aberdeen Life Ethics Society (Ales) claims a students' association policy of "deplatforming pro-life student societies" violates equality and human rights laws. Papers have been lodged at Aberdeen Sheriff Court. A University of Aberdeen spokesperson said it was an "inclusive community". Ales believes it is being unfairly denied a presence on campus. It said the legal action followed "repeated efforts to resolve this problem through internal bureaucratic channels". The group said a pro-life position "may be an unpopular minority opinion" on the campus, but that it was fully protected by law. Ales confirmed in a statement: "The Aberdeen Life Ethics Society filed suit in Aberdeen Sheriff Court against both the Aberdeen University Students' Association (Ausa) and the University of Aberdeen, alleging unlawful discrimination against the society and the violation of rights protected by UK law. "The lawsuit asks the court to declare that Ausa's policy of deplatforming pro-life student societies is incompatible with existing Equality and Human Rights law. "Furthermore, it asks the court to recommend that Ales be affiliated to the students' association, complete with the benefits and privileges that other societies enjoy." It added: "All good faith avenues for resolution have been exhausted and Ales is now forced to turn to the legal system for restitution and vindication." Ausa said in a statement:: "At this stage we cannot comment on the legal actions taken by the Aberdeen Life Ethics Society. "However following a complaint raised by the Ales, Ausa's Board of Trustees reviewed the matter and after deliberations, Ales were invited to re-apply for affiliation as an Ausa society, with the reassurance that the application would be treated in the same way as any other. "However to date no application has been received." A University of Aberdeen spokesperson said: "The University is an inclusive community and recognises different beliefs, values and cultures. "Student societies and clubs sit with the Aberdeen University Students' Association."